For the longest time, that was Dynaudio's catchy byline. Whereas the Bavarians of the famous motor works picked the ultimate driving machine for their slogan, the Danes focused on telling the truth. It is after all intrinsic to the concept of high fidelity. 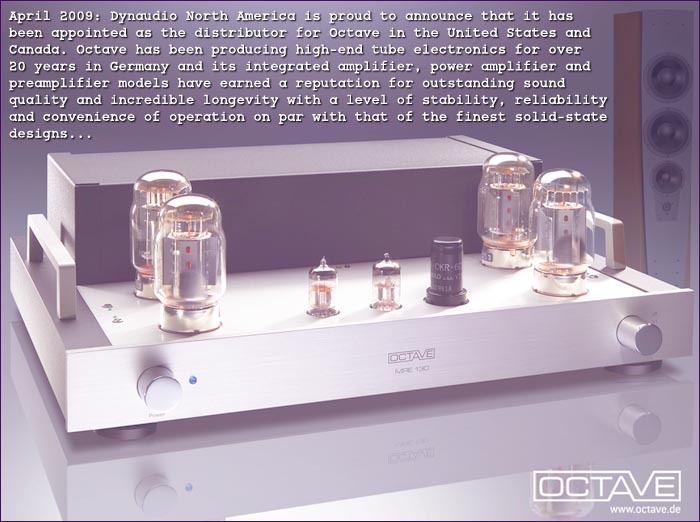 Then Dynaudio USA dispatched the above press release. While you would grant marketeers a certain freedom of spin (slogans are supposed to be catchy and slick after all), an official business alliance between a maker famous for serious speaker loads and a valve amp firm plainly is not about spin and slick. It's a statement about mutual respect, intent and copasetic performance. Aerials, Thiels and Dynaudios simply aren't the kind of speakers that ever were considered tailor-made for valve gear. Yet show after show Octave's Andreas Hofmann has made it a point to demonstrate his electronics into exactly such loads. If that wasn't telling enough -- and for the longest time, America paid no attention so Octave lacked any US presence -- Dynaudio's pick for their strategic alliance in this high-profile market should lay to rest the ancient argument about tubes lacking proper drive, control and linearity into such speakers. Years ago B&W chose Classé transistors. Dynaudio now went thermionic instead. Therein surely lies a tale. But it isn't ours to tell. Still, this connection makes a thought-provoking intro into Octave's MRE-130 monos, Herr Hofmann's top offering below his very exclusive €44,000/pr Jubilee mono towers [right]. After reviewing and awarding his brilliant V-80 integrated with optional Super Black Box and the stand-alone HP500SE preamp, I wanted a pair of MRE-130s. This was based purely on the strength of this prior exposure (for a second opinion, we also have this review of the V-80). I needed drive-anything push/pull tube amps to complete my amplifier arsenal of reviewing tools. And Octave was the very best I'd heard. Andreas recommended the optional capacitance-multiplying Super Black Boxes to assure uncompromised 2-ohm stability. I trusted his recommendation and the order was written. Octave history and philosophy was covered in detail in the earlier reviews. In short, Hofmann's father developed the firm as a transformer designer and supplier to medical, radio and industrial clients; Andreas expanded into hifi and valve gear yet keeps all manufacturing domestic to not outsource offshore. 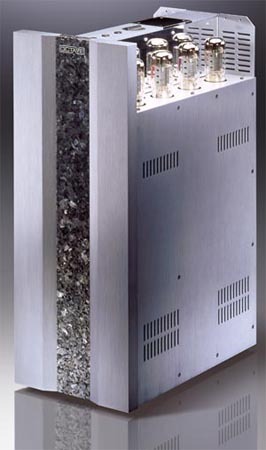 As Dynaudio rightly stated, Octave is adamant about comprehensive electronic protection of its output stages. They run 'artificial intelligence' to assure precision bias, strategic power management for delayed ramp-up and constant circuit monitoring and no-fault tube operation. For load invariability and performance linearity, Octave relies exclusively on push/pull circuits with pentodes and feedback. Key concerns are immunity to back EMF, phase stability, wide bandwidth and low noise. The MRE-130s run a classic pentode rather than UL output stage. Two 6550s or KT88s parallel per phase and benefit from non-traditional additional power supplies for regulation. Driver tubes are 1 x 6C5 (an octal triode inside an outer metal casing) and 2 x ECC82 (E82CC, 12AU7A, 5814, 6189) which are anticipated to last 10 years. The power pentodes should run 3 - 5 years. All tubes are checked and play-tested by Octave to require no burn-in. Each MRE-130 measures 485 x 408 x 176mm WxDxH and weighs 22.7kg. Tube sockets are ceramic with silver contacts, the double-sided PCBs use 130u Cu traces with thru-holes and storage capacitors are of the low inductance kind. Power draw is 160 watts at idle, 320 watts at full power. Max power is 130 watts into 4 ohms (140 at 2% THD), frequency response is 10Hz to 80kHz +/- 0.5dB. There are no relays in the signal path. Feeding signal during the 2 to 3-minute warm-up cycle could pass a distorted signal but the amps are unconditionally stable unloaded. An unusual feature is the rear-mounted mute toggle. It allows cable swaps without power-down. Selectable RCA and XLR inputs are standard as are paralleled winged speaker terminals for biwiring. The optional Black and Super Black Box connect via 50cm multi-pin umbilical (longer umbilical lengths upon request) but not to the wall directly.